Due to the fact that the Monday Morning commentary hardly ever actually happens on Monday, I have decided to rename the series, “The Preacher’s Wife” Commentary. The Spirit and purpose of the commentaries will be to share with my blog readers, and thereby journal and remember for myself, my personal synopsis and summary of the things God is doing at the Bridge Church and give a brief overview of my thoughts on the sermon and sermon series. Of course, I am my husband’s (The Lead Pastor of the Bridge Church) biggest cheerleader, so don’t expect to find my commentaries containing any potshots at the choice of sermons or sermon series. I know from first hand experience the hours of prayer and fasting and studying that go into every decision that is made, so I can rest confidently not only as his wife, but first and foremost as a member and servant of The Bridge Church, that our Pastor hears from God. Will everything that happens always be perfect? Absolutely not, but you can rest assured that motives, hearts, and intentions are pure. That is why I love the Bridge Church. It exists to reach those far from God and those who have never known God to bring them into a thriving relationship with Christ and equip them for service in the kingdom. I am so blessed to be a part of a church that has the great commission as it’s primary mission. Hopefully these commentaries will happen on a weekly basis, however, realistically there will be times when they get buried under a pile of other duties. Regardless though, know that the “Amen” corner and cheer leading section of the Bridge (comprised of me being the captain) is always there to encourage the Pastor and my fellow friends in Christ. 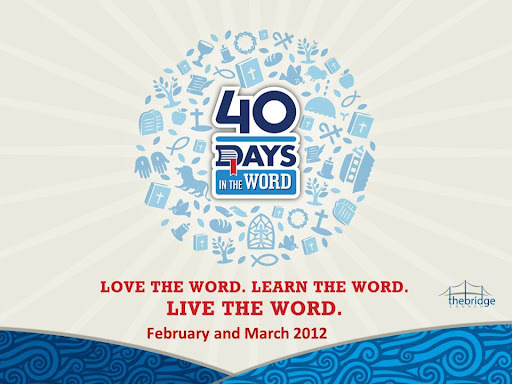 This past Sunday was sermon number 2 in our “40 Days in the Word Series”. This series has been an amazing way to drive all of us into the Word of God, not just for information, but for transformation. Our Pastor has said he feels like our church is going to grow, God is going to perform miracles in every life, and every person that participates is going to reach new levels in God through this campaign. You literally can’t go wrong in your life by adding a daily devotional. So far, there have already been reports of miracles. We have 9 different “DevoGroups” or Devotional Small Groups going during the mid-week where people are coming together to learn how to study the Bible, live on purpose, and put the Word of God into practice. Our church is experimenting with a devotional blog right now to become an asset after this sermon series is over. A church that Loves the Word, Learns the Word, and Lives the Word will be a blessed, growing, thriving epicenter for the glory of Jesus Christ. Sermon 1 was “Building your Life on the Bible” and this past week was “Why can I trust the Bible”. Ultimately, you can trust the Bible because it is the Word of God and God is true, but, there are reasons beyond faith and belief in God why you can trust the Bible. 1) It is Historically Accurate- Archeology always confirms the Bible eventually and the Scriptures have been copied with extreme care. Most of the Bible is from eyewitness accounts. 2) It is Scientifically Accurate- The Bible wasn’t given to be a textbook, doesn’t use scientific language, and in fact is always ahead of contemporary views historically. The Bible never gives bad science. 3) It is prophetically accurate- The bible has predicted 1,000’s of events that happened just as God said. 4) It is thematically unified- Out of 66 books by 40 different authors over a period of 1,600 years in over a dozen countries on 3 different continents in at least 3 different languages by people from all walks of life, comes one unified message. The Bible makes one book with one main story without contradiction that has survived centuries of attacks. 6) The Bible has survived all attacks- The most despised, derided, denied, disputed, dissected, debated, outlawed and destroyed, bestselling book ever! So, this Sunday, you will see me in the “Amen” corner cheering on our Pastor because I know that he uses the Bible as the guide and basis of all he does. You can quote me on that. I am loving this series. Nothing refreshes my soul like spending time in the Word of God. John 1:1 and John 1:14 are my two favorite scriptures about the Word of God. In the beginning was the Word and the Word was with God and the Word was God. And the word became flesh and dwelt among us and we beheld his glory, the glory as of the only begotten of the father, full of grace and truth.